Today H & M had a wonderful action again. 50 % discount on a couple of items. I saw this lovely white sweater for 9,95 euros (normally 19,95 euros). 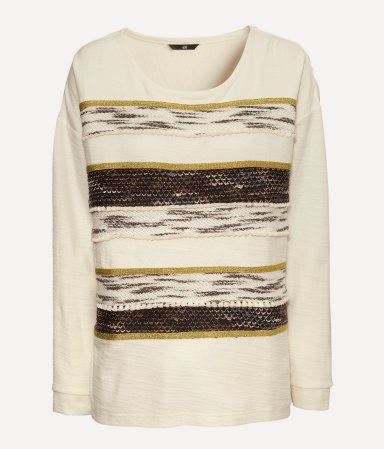 Again a kind of 'Indian style' sweater, with the fringes at the top. And for such a small price, I had no choice but to order. Plus, I used another discount of 25 % and I managed to get the sweater for only 7,46 euros. Talk about cheap! I'm not that sure of this sweater just yet. It looks very different and that's what I like about this sweater. Not sure of this sweater is my style though. I just have to wait and see I guess! 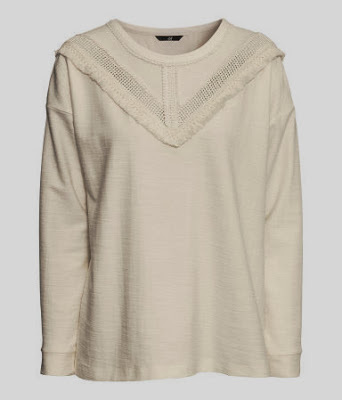 This sweater was 9,95 euros as well (normal price is 19,95 euros). I payed 17,31 euros including the forwarding charges. Which means I payed less than one sweater would normally cost. Great action H & M!